Our precision rollers are designed specifically to offer unmatched abrasion resistance. Our rollers are subject to high frictional and mechanical loads, require exceptional precision in both manufacturing standards and dimensional controls, provide high wear resistance with good frictional interface, and can last for over 37,000,000 cycles. Kryptane Systems manufactures many types of small precision rollers for the office products, data storage, small printing and measurement systems industries. 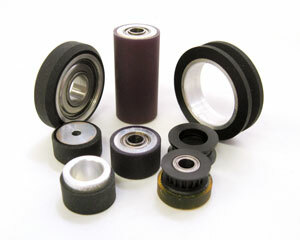 We will take your roller requirements and engineer a product that will outperform all other rollers on the market. Rollers are available in a wide variety of sizes from .300 inches to 3.0 inches in diameter, with durometers from 55 Shore A to 95 Shore A. Kryptane Systems’ rollers feature aluminum, powder metal or injection molded cores with or without precision bearings to handle the toughest loads. Send us your most demanding specifications or applications!